It’s been a couple years since I’ve put deliberate effort into sharing my photography in a consistent and purposeful way. I haven’t stopped shooting or experimenting with new things, but my time to write blog posts and maintain a website has been limited due to work, family obligations and (mostly) spending every spare bit of energy (and money!) on renovating our 1961 house. Now the major renovations are complete: a kitchen and dining room fully redone, two bathrooms torn down the joists and rebuilt, the basement finished off and converted to an art and ceramic studio for Jenn, eleven tons of landscaping rock spread and groomed, plus countless other smaller projects. There are still more projects ahead, as there always are when you own a home, but none that will monopolize so much of my time. I shot this in 1992 (26 years ago?!) and it encapsulates a lot of what I love about photography, and the kind of images I strive to create. Although we take it for granted now that our cell phones all have built-in cameras, photography has always been magical. The first photographs, taken with expensive and cumbersome equipment, were magical in that they could be created at all! As cameras got smaller and easier to use, each step of the evolution also seemed to be a miraculous feat. When Polaroid introduced instant photography in 1948, it was another magical advancement. As described in more detail below, this image, commonly called a Polaroid Transfer, was made using Polaroid pack film, which was first introduce in 1963, when I was just two years old. I shot the original on slide film with a 35mm camera, years before digital photography was available to the masses. It’s one of the first Polaroid Transfer images I made, and now, 26 years later, I still love to make Polaroid Transfer images. That is, as long as I have film; it has been discontinued. 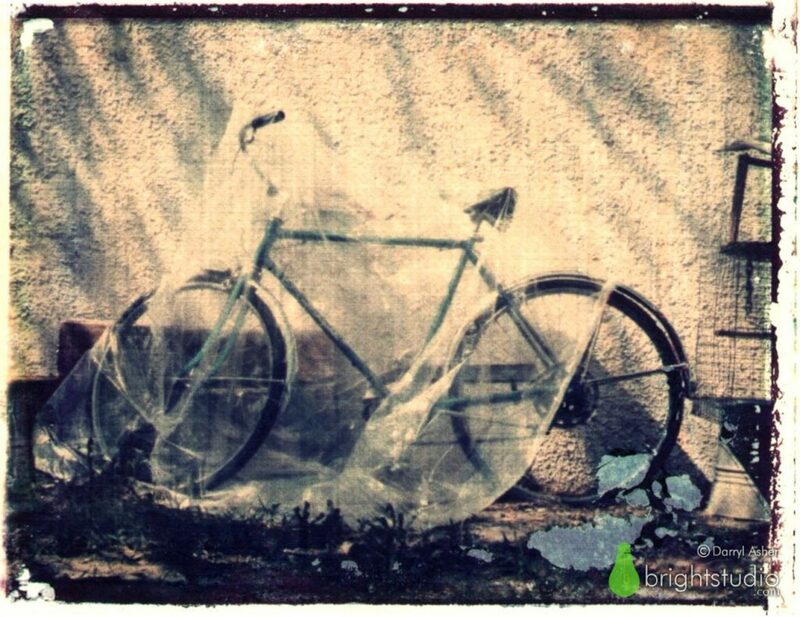 So this image merges several fond memories: bicycling as a kid, playing with my parents’ Polaroid camera, and my continuous search to do interesting things with photography. I also still create a lot of images with Polaroid and Fuji instant films. You’ll see a lot of them on this site, and I’m always making more. I like the grain, the texture, and the slight abstracting of details that instant film brings. This image was shot with a Canon AE-1 35mm film camera on slide film. It was one of the first images I shot specifically to create a Polaroid transfer from. I was on a “photo safari,” walking around the neighborhood with no particular goal in mind; just looking for anything interesting. I saw this bike leaning against a house, covered with plastic to protect it from the elements. The plastic had long ago been blown halfway off, and other unused items had been stacked around it. The scene gave me a feeling of nostalgia or melancholy. Someone had stored this bike, and cared enough to try to protect it by covering it, but then forgot all about it, like leaving childhood behind. I took only one shot. Remember, before digital cameras, film could get expensive really quickly, so I never shot more than I thought I needed to. It’s a simple composition, but I felt the story was all in that frame. When I saw the developed slide, I was happy with it and couldn’t wait to see what the Polaroid transfer image would look like. There are multiple methods for creating Polaroid transfers. The most common method is to use wet watercolor paper as the receiver but I used dry linen finished printer’s paper, which gave a sharper look to the image. The linen texture emulates the look of canvas. One of the things that attracts me to the Polaroid transfer process is its unpredictability. The emulsion never releases perfectly, resulting in ragged areas. Adding a little bit of chaos to the process is a good thing. I often think the finished image looks like a cross between a watercolor and a photograph that’s been left out in the rain. The original image size is about 3.25 x 4.25 inches. That image is scanned, then enlarged and printed on 13 x 19 inch museum quality matte finish cotton paper. This is mounted and matted to 20 x 24 inches, using archival materials and methods, ready to frame. It’s my Print of the Month for January, so it’s half price this month only in the shop at this link.